Business expectations and demands on the data center are increasing and the impact on today’s data centers is staggering. Organisations that can move quickly to leverage these new opportunities will find themselves in an advantageous position relative to their competitors. But time is NOT on your side! If your IT team often feel that they’re always in catch-up mode because it is difficult to quantify IT contributions, it is time to understand the benefit of hyperconverged infrastructure. What if your IT teams can take workloads off the traditional IT infrastructure and migrate it to a purpose-built solution that integrates compute, memory, storage, and virtualization? This is what Hyperconverged Infrastructure is all about. HCI appliances deliver extreme reliability, dependable security, extensive and predictable scalability, simplified management, and faster time-to-value. • Provide the resilience, scalability and performance to run all your applications without compromise. • Design the data center as a fluid resource that can immediately adapt to the evolving needs of the business. 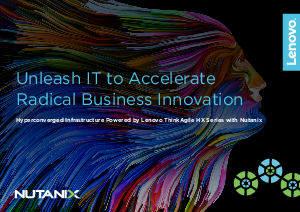 • Enable agility with scale-out architecture that eliminates the need to rip and replace for seamless growth and scale. Enabling the data center transformation is a priority for IT and business leaders. Get started now.